Civil War Descendant Project 2003-2011 raised $1250. Read synopses of these soldiers’ pension files: Henry Briesacher Christian Briesacher Friedrich Henry George Kerber Herman Schmenk Nicolaus Schmidt Henry Scheuermann. November 20-21, 2009, we observed Gustave Koerner’s 200th birthday. It was also a family reunion for Koerner-Engelmann descendants. 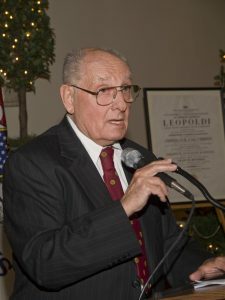 Koerner Rombauer, founder of Rombauer Vineyards of St. Helena, California, and his family attended the dinner at Bellecourt Place in downtown Belleville. 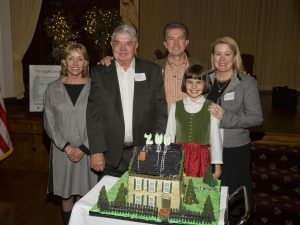 A special Koerner House cake was one of the highlights of the evening. 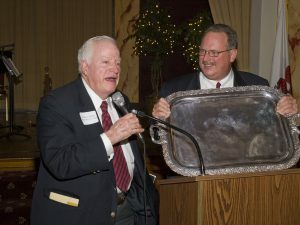 Sam Adams came from Boston and presented a silver plated tray to Belleville Mayor Mark Eckert, a strong supporter of Koerner House. The tray was a gift from the Queen of Spain, acknowledging Gustave Koerner’s service as Envoy Extraordinary and Minister Plenipotentiary, the formal title for Ambassador to Spain, 1862-64. 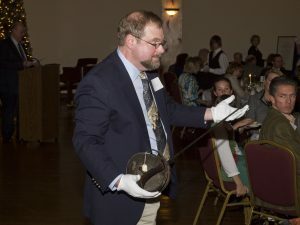 Gustave Koerner’s fencing sword from his university days was displayed by Andrew Cooperman. 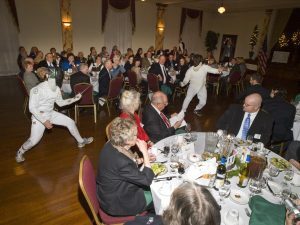 Part of the entertainment was a fencing demonstration put on by members of the Boy Scouts of America. Wolfgang Stueken, at right, a German researcher who provided exhaustive background on Koerner’s years in his native land, took the birthday party as an occasion to present a special gift to the Koerner House Committee. It was an original copy of a letter from a leading German politician to Gustave Koerner which Wolfgang found in a New York bookstore. 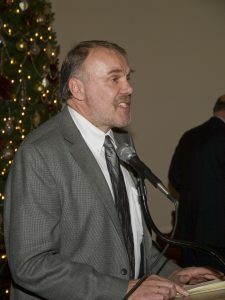 Speakers presented vignettes of Gustave Koerner’s career. Wolf Fuhrig of Jacksonville, Illinois, center, a retired history professor, spoke about Koerner’s connection to Lincoln. 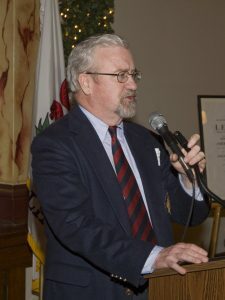 Professor Steven Rowan of the University of Missouri-St. Louis, lower right, who provided research on Koerner’s early years in Illinois, also spoke at the dinner. Mary Armstrong of Michigan, a contributor to Koerner family research also attended. Irma Rombauer, who married a grandson of Augusta Koerner, Gustave and Sophie’s daughter, wrote the “Joy of Cooking” cookbook. 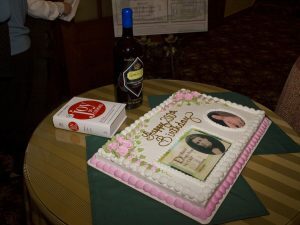 A Rombauer Vineyards wine bottle, a cookbook and the Koerner House cake made a nice memory of the birthday dinner. 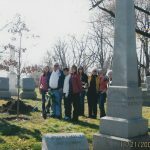 The next day the descendants visited Walnut Hill Cemetery to plant a tree at the Koerner family plot. Thanks to all descendants and presenters at the dinner for making it a memorable evening. 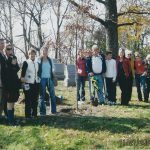 Here the Koerner Rombauer family poses after planting a memorial tree at the Koerner family burial plot on November 21, 2009.